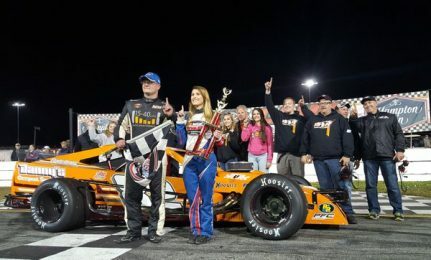 Coming into Tuesday’s Tour-Type Modified feature at New Smyrna Speedway, many thought there was no one in the field that would top Ryan Preece. However, when Preece’s car started to go ill-handling in the final laps — Ron Silk got on his horse and drove on by. Silk scored the checkered flag in the first modified feature of the week at Smyrna by just a few car-lengths over Preece, after passing him for the lead with just four laps remaining. Silk started 4th in the 14 car field on Tuesday, but never really was a factor until the final laps. JR Bertuccio and Tyler Rypkema brought the field of modifieds to the green flag and Rypkema, a rookie at the Smyrna World Series in a modified, made his move to the point from the outsdie lane at the green. Rypkema was able to open up a small lead in the early going, but it wasn’t long before Preece started making his move. He darted from his inside 7th place starting position right to the outside at the first lap conclusion and climbed his way into the top four before long. By lap 6, he had his TS Haulers machine at the point — driving by Rypkema on the inside lane with a power move. While Preece drove to the point and started to take off from the field, Rypkema was holding off a tough challenge from behind. He had pole sitter JR Bertuccio hounding the back bumper, trying every lane to find a way around, but coming up short. While Bertuccio was on offense — he also had to be on defense — looking out his back window. Silk and Justin Bonsignore were chasing down Bertuccio, trying to find a way to get back the drivers running second and third. All four drivers ran nose-to-tail for more than 10 laps, slicing and dicing, but no positions changed until just before the halfway point, when Bertuccio grabbed second and brought Silk and Bonsignore with him. While they tried to chase down Preece, the first caution flew on lap 35, when Tommy Catalano spun. That set up a restart where Preece chose the outside lane and went back to the lead, bringing Bonsignore with him. Bonsignore darted from fourth, hanging onto the back bumper of Preece and sliding to the bottom into second behind him — but he couldn’t put up the fight needed to catch him. A second caution flew on lap 42 for Jimmy Zacharias who spun off turn four and that was where Preece struggled. Though he got to the point at the green, Silk, who had cleared Bonsignore just before the caution for second, was hot on his tail. He slid under a loose Preece with four laps to go and drove into victory lane on night one of modified action. Pole sitter JR Bertuccio crossed the stripe in third, while Chuck Hossfeld and Bonsignore completed the top five spots. In other racing action on Tuesday, Harisson Burton won the 50 lap Super Late Model feature. Burton got out front early on and drove into the sunset — easily scoring the victory behind the wheel of his No. 12. He beat out Ty Majeski on a restart with just 14 laps remaining to secure his first victory of Speedweeks. The race included multiple early incidents involving names like Zane Smith and Derek Kraus, but also included a hard crash by David Garbo Jr. in the late laps. All drivers were able to escape without injury. Behind Majeski was Stephen Nasse in third, Christian Eckes in fourth and Derek Thorn in fifth.